-This allows the player to discard one card if needed to create their best possible hand prior to the option to hit or stand (this promotes a sense of control over the outcome of a hand). -With a Quick Seven® (1st card dealt is a seven; no discard is used), the player has the option to win 1 to 1 regardless of the dealer’s hand (a Quick Seven® occurs 53.8% more often then a Blackjack). -With a Quick Seven®, the player has the option to (declining the 1 to 1 payout), Challenge™ the dealer's hand with their original bet for a chance to win 2 to 1. -With a dealt bust (1st and 2nd card dealt is an 8, 9, or 10), the player has the option to place a Hazard Bet™ equal to their original bet. With a Hazard Bet™, the player has a second chance to redeem their losing hand. -To have a hand with a value of seven or as close to seven as possible, allowing one discard. -Numbered cards hold their face value. Jacks, Queens, Kings, and Aces all have a value of one. 1) Before any cards are dealt, the players place their bets. 2) The dealer then deals each player one card face up; then the dealer receives one card face down. -A discarded 8, 9, or 10: the player receives another card and the option to hit or stand (8’s, 9’s, and 10’s are an automatic discard because their value is greater than seven). 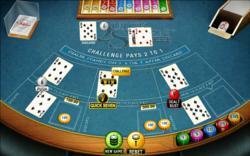 -Six or less: additional cards are dealt until the player’s hand totals seven or greater than seven. If the player’s hand totals greater than seven, the dealer will discard one card of the player’s choice, as long as the hand value remains seven or less. 4) After a discard, the player can choose to stand or hit again as many times as the player chooses, as long as the hand value remains seven or less. If the total goes over seven again, the player busts. 5) The dealer then flips over their first card. 6) The dealer has the same goal as the players, except the dealer must choose to play the high card or the high total of their hand. 7) After a discard, the dealer has to hit on four or less and stand on five or greater. -Choose the high card or high total of a hand. -Never hit after a discard (example: hitting on a 4 is similar to hitting on a 15 in Blackjack). -Never Challenge™ on a Quick Seven®. -Never place a Hazard Bet™ on a dealt bust. -Using basic strategy, the house edge for Quick Seven® is approximately 2.63%. Quick Seven® is currently available as a new casino game app in the Apple App Store for the iPhone, iPod touch, and soon, the iPad, via our partner Avalinx, Inc. Quick Seven® is also the latest addition to the Phantom EFX series of Reel Deal Casino games, featured in Valley of the Kings. Quick Seven® is also available through Casino Party Planners, the first casino party company in the world to offer Quick Seven®, providing the game to customers in Florida, Illinois, Indiana and Wisconsin.